Defend Townsville with this fun and fierce LEGO® The Powerpuff Girls™ 41288 Mojo Jojo Strikes set! 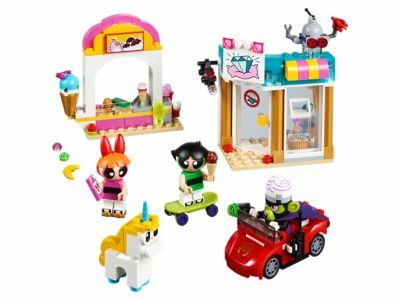 This cute set features an ice cream stand with counter and ice cream launcher, a jewelry store with opening door, rotating camera and breakaway wall, plus a getaway car with stud shooter, skateboard, a pair of roller skates, 3 minifigures, and robot and unicorn figures. Price is 18% below the initial Lego retail price, a € 7.00 discount! This comes down to 14.47 cent per brick. The Mojo Jojo Strikes (41288) Lego set is available from the sites below. However, they do not offer delivery to your selected region. The Mojo Jojo Strikes (41288) Lego set is no longer directly available from the sites below. However, 3rd party partners of these sites might still have the set available. Alternate description Help the Powerpuff Girls™ battle Mojo Jojo and his robot! Includes 3 minifigures: Blossom, Buttercup and Mojo Jojo, plus Donny the Unicorn and robot figures. This cool toy for kids features an ice cream stand with a counter and ice cream launcher, plus a jewelry store with an opening door, rotating camera and a wall to shoot off with the getaway car's stud shooter. Getaway car features an aimable stud shooter, space for the robot or stolen jewels and a handle on the back for one of the Powerpuff Girls™ to hang on. Push the button to launch ice cream scoops and toppings at Mojo Jojo and his robot. Push the lever to break out the wall of the Townsville jewelry shop. Throw the banana out of the car or use the car’s stud shooter to trip up Blossom and Buttercup. Accessory elements include a remote control, 2 ice cream cones, 6 ice cream toppings, skateboard, pair of roller skates, cell phone, 2 diamond elements, dynamite and a banana. Getaway car measures over 1” (3cm) high, 2” (6cm) long and 1” (4cm) wide. Ice cream stand measures over 3” (9cm) high, 3” (9cm) wide and 1” (4cm) deep. Jewelry store measures over 3” (10cm) high, 3” (9cm) wide and 1” (4cm) deep.